The Welding Program at Western Texas College focuses on practical experience and applications from business and industry. 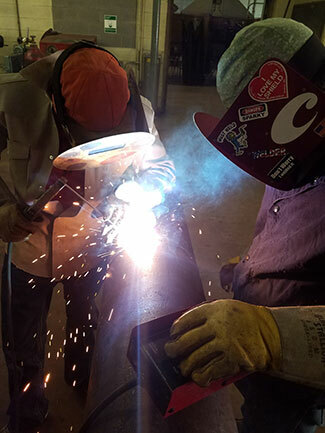 Classes are taught with a hands-on approach, giving students the opportunity for application of knowledge gained in the program and preparing students to successfully enter welding careers. To develop skills in the use of the tools of the trade so that a student may be successful in taking and passing examinations to become employed or to become a certified code welder. To develop knowledge and skills in reading a blueprint and the ability to follow that blue print to design, layout, and fabrication of the desired structure. Students may choose the two-year Associate in Applied Science Degree curriculum or one of the two one-year certificates. Course descriptions and tuition and fee information is available in the Catalog or contact vocareers@wtc.edu for more information.